Home > Movies	> Wolverine! It really wasn’t until the X-Men movie series that I began to appreciate Wolverine (Wolverine!). Maybe it was because his meat-slicing ways were toned down (a bit), maybe it was because of Hugh Jackman’s considerable charisma. Anyhow, while I still haven’t picked up any copies of his new, hawt graphic novel Wolverine vs. Incontinence, I did eagerly see X-Men Origins: Wolverine on its opening weekend. Now, you may have noticed that every time I mention Wolverine (Wolverine! ), I have a need to shout “Wolverine!” This actually has nothing to do with Wolverine (Wolverine! ), but rather to the terrible, terrible Russkies-invade-America flick Red Dawn, in which a group of high-school football players–the Wolverines–resist the Soviet army. 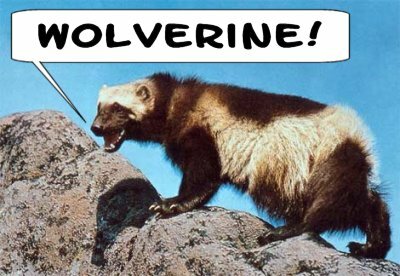 And shout “Wolverines!” (plural). 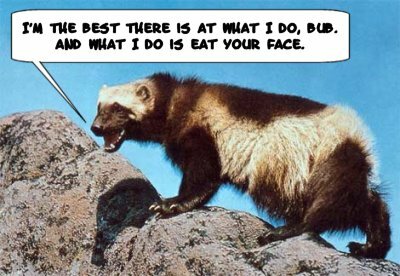 So, as I said, nothing to do with cigar-chomping, metal-bladed mutants, but I (and, by osmosis, Vic) cannot now mention Wolverine (Wolverine!) without crying “Wolverine!” While we felt it would be rude to shout while at the multiplex, we did whisper the word frequently. All in all, I enjoyed the flick well enough. It certainly doesn’t deserve the critical drubbing it’s received on Rotten Tomatoes (currently 37%). It successfully delivers plenty of mutant-on-mutant action. The two big action set-pieces–the jeep/helicopter chase heavily featured in the trailers, and a final battle atop the cooling tower of a nuclear reactor–were alone worth the price of admission. The various X-Men cameos were fun, particularly a certain unpromoted appearance by one of the stars of the previous trilogy. I’m surprised that they didn’t do more with Gambit, as he’s another fan favorite and could’ve made for some good buddy-flick moments. On the other hand, there’s some remarkably silly stuff late in the film. Logan, having had his bones replaced with indestructible adamantium, escapes the Weapon X facility. General Stryker spends the next ten minutes barking orders like “Blow his brains out!” despite knowing full well that he himself just made this impossible. Though that does later bring us to the handgun filled with adamantium bullets which Stryker suddenly remembers he’d had made for just this sort of thing. For some reason–possibly due to the implication that Logan is also something of a werewolf–Vic found this hilarious. For my part, I mostly wondered why he didn’t give the adamantium ammo to the guy whose mutant power is shooting stuff. Oh, and did I mention the ultimate weapon which requires one to type out commands such as “decapitate?” What, they couldn’t have assigned decapitation to a function key? The main thing working against the film was that it was largely unnecessary. The backstory of Wolverine (Wolverine!) was a major part of the X-Men film trilogy, specifically X2. I did enjoy the Logan-through-the-ages montage which plays behind the titles, as the notion of him being effectively immortal was introduced after I’d stopped reading the comics. That said, I don’t believe that we learned much of importance. And crafting a revenge tale in which the two targets of said revenge are both known to survive long enough to appear in the chronologically-later X-Men films is a challenge the filmmakers didn’t entirely overcome. To me, it’s obvious that the studio didn’t think the film was a slam-dunk, as they were quick to claim (in an outright lie) that the workprint which had leaked onto the Internet lacked an additional ten minutes of footage. There’s a mid-credits bonus scene that is so completely pointless that it almost seems like someone edited it in by accident, but I don’t think that’s the footage to which they referred. There are also, apparently, two different post-credits scenes. From the descriptions I’ve read, Vic and I saw the better of the two. But anyone hoping for Samuel L. Jackson to show up and mention the Avengers Initiative will be disappointed. Despite the opening-weekend success of X-Men Origins: Wolverine (Wolverine! ), I believe that the filmmakers ought to rethink their cunning plan of making a similar film based around the villainous Magneto. Oh, sure, there’s probably a story there, but while Magneto is “neat-o,” he’s not the draw that is Wolverine (Wolverine!). Besides, Ian McKellen really, really isn’t getting any younger.